To be a Leicester City fan is something special. As a fan from abroad “flying in”, you plan your trips in advance and you have always a route to follow. This time we had several highlights to look forward to. We were invited to a party in Wolverhampton, and at the Wolves nest at Molineux Ground we were four foxes fans, celebrating together with fellow Wolves and other friends and fans from Norway and England. We started early the next day, on our trip towards Burnley and Turf Moor. Going up the railway tracks passing Stoke-on-Trent, of course Gordon Banks got on our mind, buried just a few miles away a few days ago. To see a strong Kasper Schmeichel carry the coffin of Gordon Banks, together with fellow goalkeepers of Gordon’s former clubs and the national team, made a monumental impression. As we came into the Manchester station, we were heading for a new train track, this time hopefully taking us to Burnley. But as we were waiting for the train to leave the platform we got new messages that it will not go as far as Burnley. We decided to take a taxi with two other fellow Norwegians, two guys we had never seen before, but they had heard us speak, so they asked if we wanted take a taxi with them, and so we did. We arrived at Turf Moor at the time that we had scheduled with the train, so everything went smooth and perfect. The rain poured down as we entered the stands, and so great to be among our own and also see that the club cares a lot by handing out scarfs to everyone in the away area, just fantastic. We all took our scarfs and waved with them as the players entered the field and despite the early sending off we had great hope. Leicester City defended really well and with the two strikes from James Maddison and “Captain” Morgan, the feelings of the PL winning season was back like a flash. To see our captain, 35 year old Wes Morgan, leading by example and just being that powerhouse of a defender we used to know, was a bit unreal as he came on as a sub, fighting so hard and really making the day complete. We had a plane back to Norway from Manchester the next day and stayed at a nice hotell at the airport. 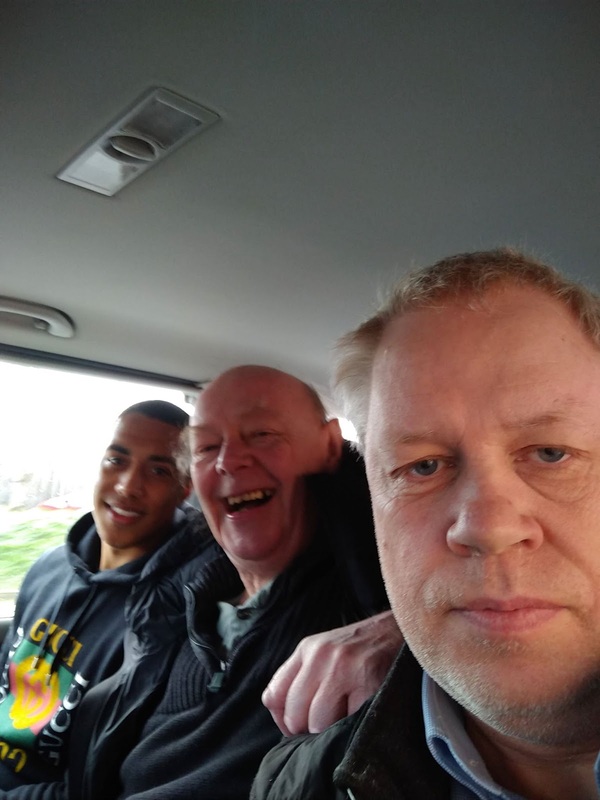 As we were sitting at the breakfast table, we thought one of the guys beside us looked quite familier, and my fellow traveler said, is that Youri Tielemans, go over and ask him. I said, no, let him have his breakfast and don’t bother about it, if he is, who we think he is, we should just leave him alone. So we did and went for the shuttle, taking us to the airport. The guy we thought was Youri Tielemans jumped into the seat of the shuttle and we were all sitting there together. My friend who sat alongside him asked if he was a footballer, and he replied “yes”, then we asked him if he was Youri Tielemans, and he said “yes”. We said we had been to the game and was Leicester City fans, and he smiled and said “I was there too”. Then he asked us “why are you flying?”, and we told him we were from Norway and my friend showed him his two Leicester City tattoos on his wrists, and Youri Tielemans laughed. We asked if we could take a picture and he said “yes”, and so we did. Youri Tielemans was great and a fantastic “on loan” ambassadeur for Leicester City, what a guy. We said, you have been tremendous for us and what a player you are, and you need to sign a permanent deal, he smiled and said, “have to wait and see in the summer”. We had a great and nice talk with Yourie Tielemans, he even asked us how many times we came over to watch games, we told him, four to five times a season. We told him how well everyone at the club takes care of fans and treat almost everyone as a family, he replied and said it was very nice and a really friendly atmosphere at the club. He also said he really enjoyed working with the new manager, Brendan Rodgers. We wished him well on his travel to play for Belgium, as we went out of the shuttle to reach our flight. This was just a surreal and strange happening, but so great and on this trip “the icing on the cake”. What was the odds on this one. Traveling from Norway via Wolverhampton, watching Leicester against Burnley at Turf Moor, seeing all travelling fans getting scarfs, going down to ten men after four minutes, taking the lead, and losing it, taking it back with Wes Morgan, not even in the line up from start, scoring the winning goal in the last minute. Then the morning after sitting in a shuttle buss to the airport in the same seat as Youri Tielemans chatting about the game and Leicester City, far above 5000/1. Over the years I have experienced some great moments as a Leicester City fan, and this is one going up and above most of them. There are lot of great moments and memories of special and unexpected meetings with players and staff, one being clapped on the head by Jimmy Bloomfield, when asked about his autograph. As a 10 year old kid in Norway, picking him out in a crowd at a friendly against Odd Skien. At the same game I jumped the fence and into the tracking field to reach Frank Worthington, getting his autograph as he came out for 2nd half. Sitting in the Sky Bar of Bodo chatting with Craig Levein and Mike Stowell over a couple of beers talking about transfers, was another funny one. I knew the agent that arranged the trip for Leicester City, so he invited us up, and all of the staff was there relaxing as we were watching out on the Bodo harbor close to midnight. Great memories also of meetings with Robbie Savage, Muzzy Izzet, Jamie Vardy, Frank Sinclair, Steve Walsh and several others at Leicester City, but this one with Youri Tielemans must be regarded as the most surreal and greatest of them all. Next Post Where can Leicester finish next season under Rodgers revolution?